If there's one thing we know about Alessandro Michele, it's that he loves reviving all things vintage, and his Resort '19 collection is no different. 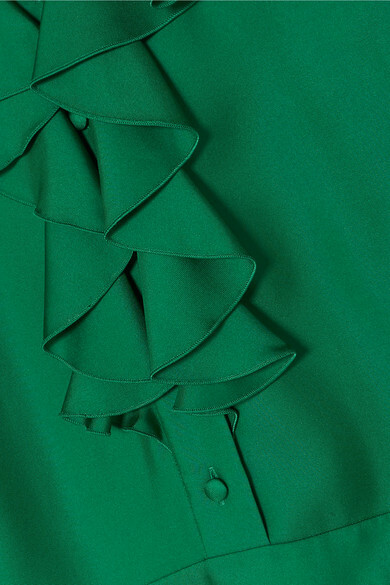 Spotted on the fire-lit runway in Arles, this lustrous silk-twill dress is modeled after '70s styles - it's trimmed with ruffles and has a sharply pleated skirt. The detachable jacquard belt is topped with a marbled resin version of the Gucci's iconic 'GG' plaque. Shown here with: Prada Bucket bag, Gucci Sandals, Chloé Earrings, Paola Vilas Ring.